MSRP: $169 (2 TB), $229 (4 TB), available at discount pricing online. As reported on this site in some of my reviews over the last few years, I’m a huge fan of NAS (Network Attached Storage) technology. At present, I own a large RAID 5 NAS, with a slave unit to back up the first unit. Why? I have this much storage to support my media server. All my movies, TV shows, music, etc., are stored on my NAS, and its manufacturer keeps adding interesting new tools to keep their devices up to date, such as cloud support (the buzzword du jour), making it easy to connect to my NAS from anywhere in the world. Providing a central location for backups, including an app to assist you in backing up and archiving your Facebook account. Wireless (assuming your Seagate Connect is attached to a wireless router) streaming of stored content to gaming consoles, media players, and smart TVs. This includes tight integration with Apple’s AirPlay® technology. Intelligent use of the cloud to easily access your content no matter where you are. This could be over a standard web browser, or via apps for other devices like smartphones and tablets. The ability to set up a centralized media library, compatible with the DLNA standards for communicating with other compatible devices like smart TVs, media players, and more. For those of you with Samsung smart TVs, you can directly access movies, music, and other content on your Seagate Central over your home network. Let’s talk about some of these (and a few things more). As long as you don’t need a bootable backup (you may have that capability separately, and if you don’t, you should), you can back up multiple computers with Apple’s Time Machine software, and for Windows users (gasp), a backup application is included. Either platform can back up to the Seagate Central device over your wired or wireless networks. There’s even an app that lets you back up your Facebook postings and media. 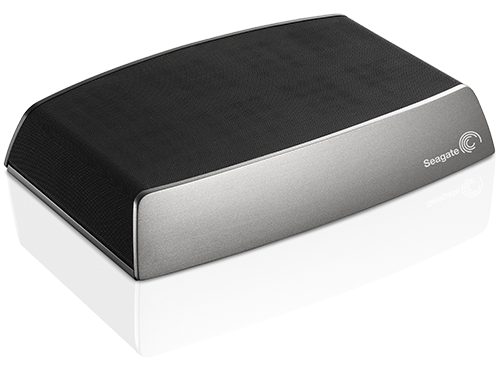 The Seagate Central can be a vital piece of your wireless network, being a central place for moving files on your home network from Wi-Fi and wired connected laptops, desktops, iPhones, and iPads, not to mention a number of Windows-compatible devices. Not an hour goes by when you don’t hear or read about another application of “the cloud.” The Seagate Central offers seamless connectivity to the cloud. What this means for you is that with a simple configuration, you can connect to your Seagate Central device with IOS® or Android® devices, from anywhere in the world that you can connect to the Internet. Imagine loading your iPhone up with photos and other content, then uploading that content to your Seagate Central, allowing you to free up storage on your iPhone for even more photos. Laptops and desktops make the connection from a web browser with a very simple drag and drop interface. When you copy music files to the public folder, the Seagate Central adds them to a shared iTunes library, and now available to all of your computers running the iTunes application. With the USB 2.0 port, you can plug external USB hard drives into the Seagate Central device. To other devices on your network, the USB drive mounts as a folder on your Seagate Central device. Alternately, you can back up your Seagate Central to the attached USB hard drive. Plug the Seagate Central device into your network. 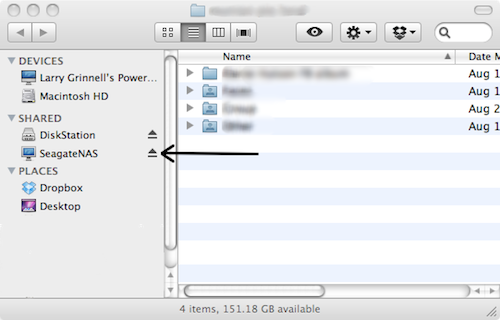 It automatically mounts as a disk device in the Shared section of any Finder window. If you do nothing else, the Public folder is available for your content without need of logins or other security. The power of this device only comes from creating a user account. This lets you configure it for Cloud use, as well as storing private data and backing up your Facebook data. 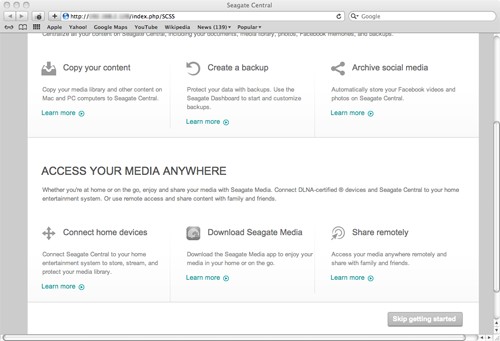 Just open the Public Folder on the Seagate Central device (under Shared in a Finder Window), and double-click the Manage Seagate Central shortcut. This launches your web browser and navigates to Seagate’s website. After the usual EULA agreement acceptance, a Personalize page is displayed. Here’s where you enter the device name (if you want to change it), user account name, remote access email address, password of your choice, and your time zone. You now have a private folder, only visible and accessible with your login and password, and the public folder. This is where you can hide personal information from prying eyes; where you can back up one or more computers (you may need to create multiple private folders to do so); where you can link your Facebook account, etc. It’s important to note that you cannot access media files stored in private folders—only public folders. This goes for all shareable content. This is also where you use the website to perform additional configuration. 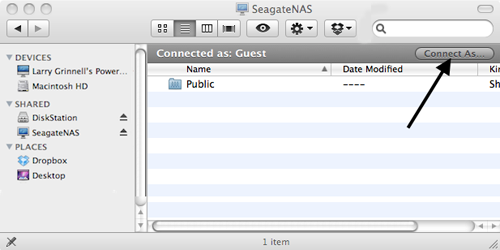 Connect to the private folder by selecting the Seagate Central device from the Shared section of any open Finder window. 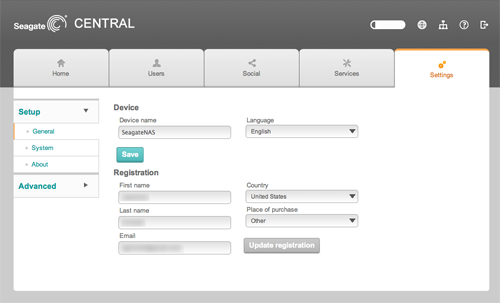 Click Connect As… and enter the login and password for the device. This is the way you would connect to any network resource on your Mac. Once you have performed all of your basic configuration, you can go to a somewhat simpler user interface for day-to-day maintenance of the Seagate Central, through a web link file located in the public folder. See below. It doesn’t come with a Macintosh-based backup program, referring you to Time Machine instead. That’s all well and good, but it doesn’t answer the question about how to use this device to make a bootable backup. Then it hit me. Stupid! Stupid! Howtheheck do you connect to a networked device when you are in the bootup process? The simple answer is, you don’t. 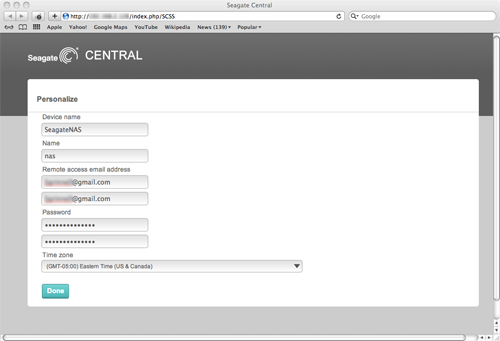 The Seagate Central device is great for backing up select files and folders using Time Machine. If you want to back up to a bootable device, use something like Carbon Copy Cloner, or similar applications to a directly connected USB 2.0 or equivalent external drive. MyMac review rating is of 9 out of 10.